All of the children at The Peterborough School Nursery love to take Beebo Bear away with them: on their holidays, to family birthdays, to weddings, christenings and also to religious celebrations such as Chinese New Year, Easter and Eid. 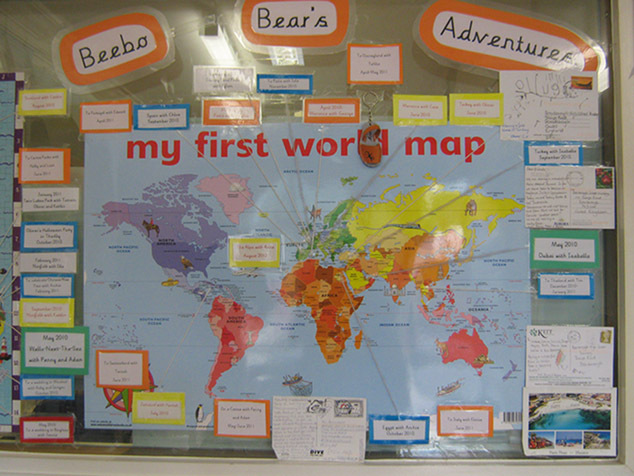 The children enjoy getting Beebo's passport stamped at passport control and they also take photographs of him on holiday, draw pictures of him and read stories with him. We feel this is an extremely valuable way for the children to celebrate their personal experiences and to share them with their peers. Beebo is available to all children from the Baby Room, Toddler Room, and the Pre-school and has become a very popular fixture within the Nursery!